Hope your ready to get this party started. I can’t believe it’s almost time for back to school! Can you? I can’t wait to see all your inspiration crafts, creativity, DIY s, beauty and fashion and recipes! I’ll been tweeting and pinning this week and will continue to share your posts. If you missed last week’s craft and creativity party you can find the party #104 here. Hope your ready for this week’s Inspiration Spotlight Party. Here’s a recap of this week on the blog in case you missed any posts. Be sure to take your chance on the current giveaway too! Febreze #Noseblind Test + Prize pack Plus $60 AMEX gift card Giveaway! Online Art Journaling Class with Dawn Devries SoKol + #free 14 day trial! See how Stacey transformed a crate to this pretty stenciled silverware wood caddy. You can find the diy over at Addison Meadows Lane. Joy over at Yesterfood shared this great easy sewing tutorial for how to make your own travel pillow and pillow cases. If you are a beginning sewer this would be the perfect project. 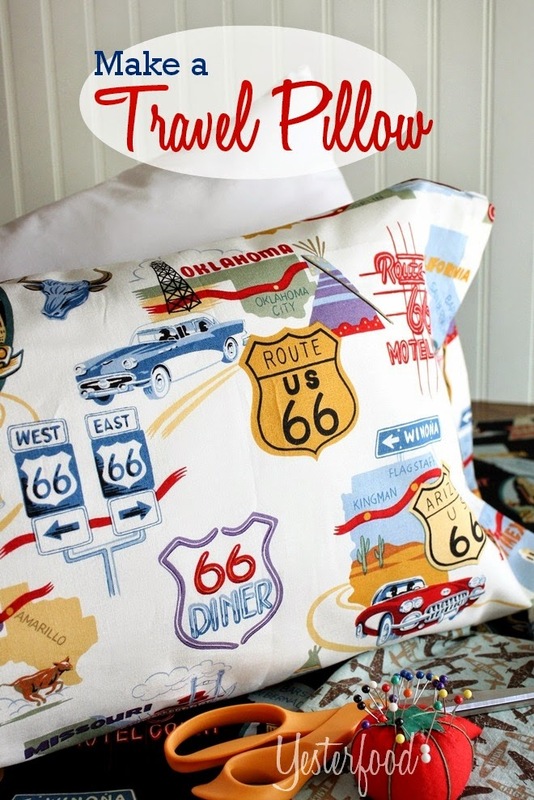 Don”t you just love the Route 66 fabric she used?! How many times have you or your kids gone looking for a pen when writing in their notebooks? Elena from ElsJourney shares how you can easily create this elastic closures to slip on to notebooks. Pick out your colors and grab the tutorial from her. A quick and easy solution for back to school. Wanda shared this lovely salad recipe with beets, apples and goat cheese. If you love beets you’ll be heading over to grab Wanda’s easy recipe for a refreshing salad where she shares a homemade dressing mix. Oh, yum! Well there were too many to list this week and I’ve been battling the flu. I’ve been pinning and tweeting. But, be sure to see last week’s party linked above to see more! We’ve had two week’s with a summer flu going through our house. I guess I’m glad school hadn’t started. Get out your sanitize r gel early folks!! We haven’t been sick with the flu in years and this one knocked us out big time! Due to InLinkz changes the party links show on an external page! Thanks for dropping by to share. It’s always great to see you. Hello Theresa. Thank you for hosting and all that you do to promote our posts! Hope you have a beautiful day. Theresa, I’m so excited that you included my Travel Pillow in your features this week- thank you so much! 🙂 Sharing your lovely party! My pleasure Joy! And thank you for sharing the party and coming by each week. Thank you so much for the feature, and for hosting such a great party! Have a great day! Hi Stacey, Your welcome and thanks for coming by to share at the parties. Thanks for hosting Theresa! This week’s features are great, love the travel pillow! Hi Roxy, Nice to have you drop by to share at this week’s party. Hope to get to know you better. Hi Marcy, Thanks! I’m going to do my best and hope yours is great too! Hi Bobbi! TGIF & Your welcome! Hi Kim, I’ll try one of these days. It’s been one thing or another lately. First traveling for 5 weeks and sickness running through the house for 2. Maybe after school gets back in I’ll find more time. Thanks for coming by! So happy to be featured. Thanks for hosting this great party.